Joe Lee believes in staying the course, from beginning to end. So that means the Bullis (MD) School track and field coach isn't bringing out any new tricks with less than a week to go until New Balance Nationals Indoor. Instead, he offers moving words for his athletes to reflect upon every week. "We try not to do too many things different," Lee said. "Because if we switch up the game now, that would tell me we may not have done things right from the beginning." Under the guidance of Lee and his assistant coaches, the Bulldogs have certainly made a giant leap in 2017-2018. With less than a week to go until nationals, the team's girls are turning the corner and could score a potential season-end of epic proportions. The squad has a chance to win as many as five relays -- 4x200, 4x400, SMR, shuttle hurdle, and mixed -- over three days at The Armory in New York. And his boys team, ranked US No. 1 in the 4x200 and US No. 5 in the 4x400, has a chance to gobble up championships as well. "As far as where we've come from, from ground zero to now, it's kind of hard to compare the seasons," said Lee, a former quarter-miler at George Mason. "The way my mind works and our system works, the goal is to never win the national championship. The goal is to maximize your ability to potentially overachieve with what you've been given." A year ago, the progression of the girls team led the Bulldogs to a national title in the 4x400, a third-place outing in the shuttle hurdle relays, and an eighth-place finish in the SMR. His boys were third in the 4x200. But it almost seems like that wouldn't be enough in 2018. 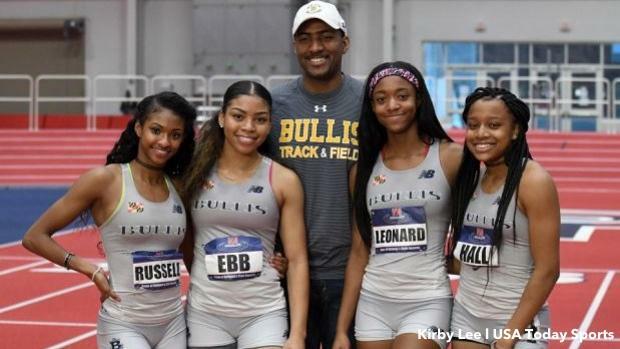 Bullis' girls, which earned a national record in the 4x200 in January by crossing the line in 1:35.39 at The VA Showcase -- surpassing the 15-year-old record held by Long Beach Poly of 1:35.86 -- are shooting for much more. The team has four girls -- Shaniya Hall (24.34), Masai Russell (24.43), Ashley Seymour (24.36), and Leah Phillips (24.46)-- ranked in the top 25 of the 200m nationally. They want a national record in the 4x400, too -- currently, the Bulldogs own a US No. 1 mark of 3:39.60, which is just a second off of Long Beach Poly's 2004 record of 3:38.81. The team has four girls -- Hall (55.63), Russell (56.10), Sierra Leonard (56.19), and Kasey Ebb (56.30) -- ranked in the top 35 nationally as well. And they want their girls and boys to maximize efforts in individual events. "In full transparency, it's not that we don't want to win or go after records," Lee said. "We do. But it's not the top priority. We realize that every team we've seen, we haven't seen their best yet. "We know that not everyone will lie down on the track and allow Bullis to run across the finish line in first. We'll take everyone's biggest and best punch. And we thrive on that." Most coaches instill the same concepts. Lee isn't breaking any new ground with thinking that going after records will set them apart from any other squad in history. But the development of this team from 2013 -- when Lee first took over -- to now has been markedly elevated. And that's one reason why this indoor season has been different. The expectations are higher. The kids' understanding of their abilities is greater. And Lee's responsibility of getting his team to their best is at an all-time high. "We're technical in our drills, we're intentional in making sure we're coaching kids properly and getting kids the right information and looking at film," he said. "We're working hard, but we're also having fun. We keep it light, but at the same time, we keep it focused." If all that sounds intensely serious, Lee makes sure to mention that isn't the case. The team isn't stiff. "Kids are still acting goofy," he said, "playing practical jokes on themselves and me. We keep it fun." Because the team has traveled out of state to compete in numerous events -- in New York, Kentucky and Virginia -- they've developed friendships with other athletes. Sometimes Lee has to remind his athletes that competition is still the priority. "Ashley Seymour is uber social," Lee said of his senior sprinter. "At The VA Showcase, she's chatting with Thelma Davies in the 60m right before they got in their blocks. And I had to say to them, 'Ya'll know you have to run, right?'" "But they're teenagers," he added. "They know how to turn it on when it counts." 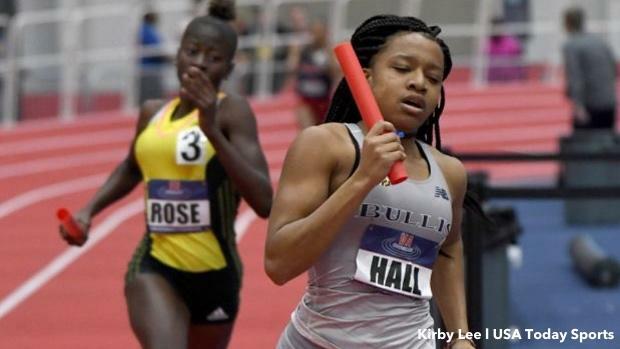 New Balance Nationals Indoor will be the team's most difficult test yet. While Bullis has faced off against Nansemond River, Western Branch, and Oak Park at various parts across the season, each team will be vying for their own championships in New York, too. Nansemond River, for instance, could be going for its third straight win in the 4x200. So Lee isn't taking the squad -- which includes national-caliber anchor Kori Carter -- lightly. "They're the two-time defending champs," he said. "They're fully loaded and going after the national record, too." Oak Park (MI) High's girls, which finished second to Bullis a year ago in the 4x400 and typically have impressive depth at the quarter-mile, are likely contenders in the relay as well -- the school's club, Motor City Track Club, is currently ranked US No. 4 and is led by senior Miyah Brooks, who's run 55.65. "On paper, they're a faster team than us," Lee said. And in the shuttle hurdle relays, where Lee's team is US No. 1 (31.13) by just a hundredth of a second over Western Branch (31.14), nothing is guaranteed. Especially considering the Bruins are trying to send off their legendary coach, Claude Toukene, in the best way possible. "People are bringing it to us," he said. "That excites us." Lee knows he can't change things up at this point. "Our program is designed to make sure that we're doing our best to train them to the highest level of their ability from day one."